Antonio Conte got off to the perfect start as Italy coach as early goals from Ciro Immobile and Daniele De Rossi secured a 2-0 win over Netherlands on Thursday. Conte – tasked with leading Italy into a new generation after Cesare Prandelli's post-World Cup resignation – could not have hoped for a better start in Bari. Immobile fired them ahead after just three minutes when a long Leonardo Bonucci ball caught the Netherlands defence napping. And worse was to come for the visitors - beginning their own new era under Guus Hiddink, who also coached them between 1994 and 1998. Bruno Martins Indi was sent off in the ninth minute for bringing down Italy debutant Simone Zaza in the penalty area and De Rossi coolly converted the resultant spot-kick. Italy had numerous chances to extend their lead, particularly in the first half, but Netherlands goalkeeper Jasper Cillessen did well to keep them at bay before the contest fizzled out in the latter stages. Conte - widely regarded as one of the best coaches in Europe after leading Juventus to three successive Serie A titles - will be encouraged not only by the result, but also by the impressive performance from his side. Granted, Martins Indi's early dismissal ensured the match was played on Italy's terms, but their bright interplay and attacking verve is sure to have buoyed Conte ahead of the nation's first Euro 2016 qualifier in Norway on Tuesday. Immobile quickly gave Italy the lead when Bonucci's hopeful punt split Martins Indi and Stefan de Vrij. Cillessen came charging out of his goal, but Immobile had enough time to round the Netherlands goalkeeper before tapping in with his left foot to open his account for Italy. Wesley Sneijder curled an effort over at the other end but it was a rare sight of goal for the Netherlands, who quickly found themselves down to 10 men when Martins Indi - the last man - brought down Zaza. De Rossi rolled his effort into the bottom-left corner as Hiddink swapped Jeremain Lens for defender Joel Veltman in a bid to stem the flow of goals, and while that was successful, the change did little to halt Italy's momentum. Zaza should have marked his debut with a goal in the 20th minute, but was denied by a great Cillessen save after Immobile unselfishly centred, while the goalscorer shot just over after combining well with his strike partner. Immobile missed the target again when played in by Zaza on the stroke of half-time and the latter's quest for a goal continued after the break when he shot into the side netting. Robin van Persie fired just wide for Netherlands after Andrea Ranocchia's poor headed clearance, but like Sneijder's first-half effort, it was a rare foray forward for the visitors. Italy still controlled the match but were restricted to long-range efforts - Bonucci and Zaza both tested Cillessen from distance, while Mattia Destro headed over - in the second half, as a flurry of substitutions saw the match peter out. Two goals were more than enough for Italy, though, as the Netherlands received a wake-up call ahead of their opening Euro 2016 qualifier against Czech Republic on Tuesday. Arturo Vidal says he is 100 per cent ready to start the season with Juventus despite interest from Manchester United. Louis van Gaal is an avowed admirer of the Chile international and having pursued him for most of the summer, Goal revealed that United would make a final push to sign him before Monday's transfer deadline. But Juventus have been unwavering in their public insistences that Vidal will not be sold this summer and now the player himself appears to have scotched talk of a move to Old Trafford. Vidal tweeted: "Ready to start the championship! We are 100% Juventus !!!!!" There was always a chance of a high-profile departure at Juventus this summer but nobody thought that Conte would be the one to leave. The former Bianconeri midfielder's sudden resignation as coach in July left the club's supporters in a state of shock. Their disbelief then turned to outrage when Juve opted to replace the man that had led them to three successive Serie A titles with Massimiliano Allegri, who had been sacked by rivals Milan midway through last season. However, their rage has been tempered by the club's success in holding onto Arturo Vidal, who looked set to depart for Manchester United. There is also the fact that the change of coach could most likely result in an arguably overdue change of formation, with Allegri poised to ditch Conte's tried-and-trusted 3-5-2, which, while successful in Serie A, has shown itself to be too easy to play against in Europe. 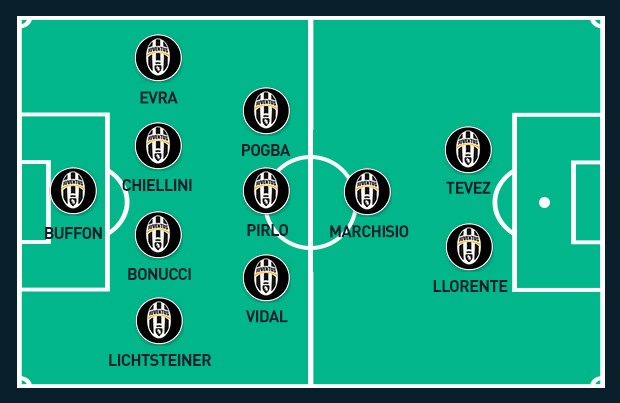 Juve now look set to switch to a flat back four, with Patrice Evra slotting in on the left-hand side following his free transfer from Manchester United. Roberto Pereyra, who has arrived from Udinese, will challenge Claudio Marchisio for the attacking midfield role in front of the regular trio of Vidal, Andrea Pirlo and Paul Pogba, with Fernando Llorente and Carlos Tevez set to renew their prolific partnership up front. However, the €20 million (£15.9m) signing of Alvaro Morata from Real Madrid, coupled with Simone Pepe's return to full fitness, gives Juve the option of playing three up top this season, underlining that while there is much uncertainty surrounding the Old Lady this season, there's also no end of unpredictability, which may not be a bad thing. Carlos Tevez has revealed that he has no plans to extend his current contract with Juventus. The Argentine has been in fine form since his move to the Serie A champions and is currently their top scorer in the league. However, Tevez has no desire to continue his spell in Turin beyond his current deal. "I want to respect my contract until 2016,” he told reporters at Buenos Aires airport. "That's my plan. "I don't want to extend; that's not how I feel at the moment." When asked if he would consider a return to boyhood club Boca Juniors, the 30-year-old urged calmness on any decisions regarding his future. "It's too hard to say right now," he said. "I'm playing at a high level so it's important to be calm and enjoy being in the moment. "Constant speculation would drive me crazy." Next fixture Napoli vs Juve on Sunday. I hope that Pogba will stay, he is very important for the team. Looks like ElevenSportsSG are showing the Genoa v Juventus match Live on Facebook.